I’ve made gallons of yogurt over the years and usually use my dad’s hand-me-down yogurt maker which makes about one quart. That quart never lasted long so I would have to make yogurt every few days. I was tired of sterilizing everything over and over again and decided that I needed a way to make a lot of yogurt at once. I experimented with making it in the oven set on the lowest temperature which happens to be 170, and that worked really great with my remote meat thermometer. I could leave the cord hanging out of the oven door and have the gauge resting on the stove to keep an eye on the temperature as I passed by doing housework and such. Then my thermometer started acting up. I can take the final temp. of an item, but it turns off on its own now so I can’t keep it inside my yogurt water bath to regulate the temperature. Rather than buying another $15 thermometer I decided to try another method. I was given my first Crock Pot this last Christmas. It was one of those, “Oh…thank you…” gifts. You’re happy to have it and very grateful for such a thoughtful gift, you just don’t know what the heck you’re going to do with it. I am a scratch cook. All I could think of when I thought of slow cooker food was church lady pot luck dinners, chicken breasts cooked all day in a can of cream of mushroom soup or a packet of vegetable soup mix. This type of cooking goes against everything culinary that I believe in and frankly I haven’t had much of it that was worth eating. Now I can understand a hunk of cheap beef dumped into some water with a bunch of veggies, a bay leaf, and some spices. You can’t really mess up a cheap piece of beef by cooking it to death, but I know from experience that a pan-seared, slow-roasted slab of cheap beef will taste better any day than one made in a slow cooker. I don’t work right now and homeschool my kids, so anything that needs my attention gets it. I don’t leave the house for hours needing dinner to cook itself. Even when I do work, because I’m a cook and work at night, I have all day to get dinner prepared for my family, even if I won’t be there to eat it with them (the not being there to eat it with them being the primary reason I’m not working, of course). So while I sat looking at my new “red to match my kitchen” slow cooker after turning my nose up at some of the “recipes” that came with the little instruction manual, I decided that I’d have to think outside of the Crock Pot box and put it to good use. There had to be lots of ways that it could save me time without me giving up my layered, flavor building cooking philosophy. Rice…now that was a given. Rice in the slow cooker. Of course! Then I thought of “refried” beans. Worked beautifully! Wheels were turning for six months, six months in which I’d used the slow cooker a total of four times. Then while I was discussing a friend’s attempt at yogurt making and why hers wouldn’t set up, I remembered why mine in the oven did…the thermometer watching. Then I remembered my Crock Pot. I decided to see if it could keep a temp. around 115 on the warmest setting, the absolute highest I thought I could culture yogurt without killing it. I started out by using warm tap water to fill the basin of the slow cooker then turned it on warm and covered it. My candy thermometer read 125 after forty-five minutes or so and held. So I knew it was definitely too hot. I decided to go the old temperature monitoring route by keeping the candy thermometer in the water to monitor the temp. 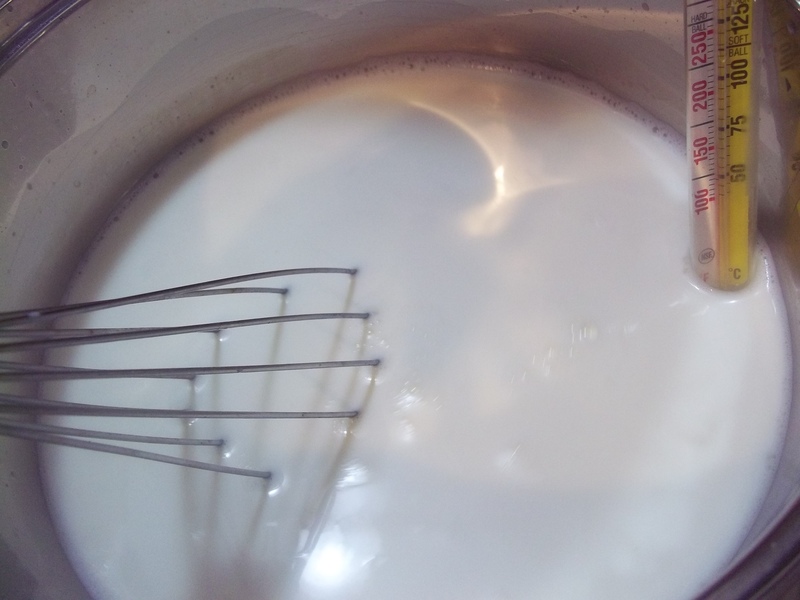 There’s a big difference between a 170 degree oven and a 125 degree slow cooker and I liked that I would not have to jar the milk/yogurt culture and place it in a water bath but because of the lower temperature, I could put the milk and starter directly into the liner of the slow cooker. By watching it on my dry run, I realized that it wouldn’t be too difficult to maintain a 108 to 113 degree temperature by turning the warmer off and on periodically, covering and uncovering the yogurt every once in a while. So I set out make one whole gallon. 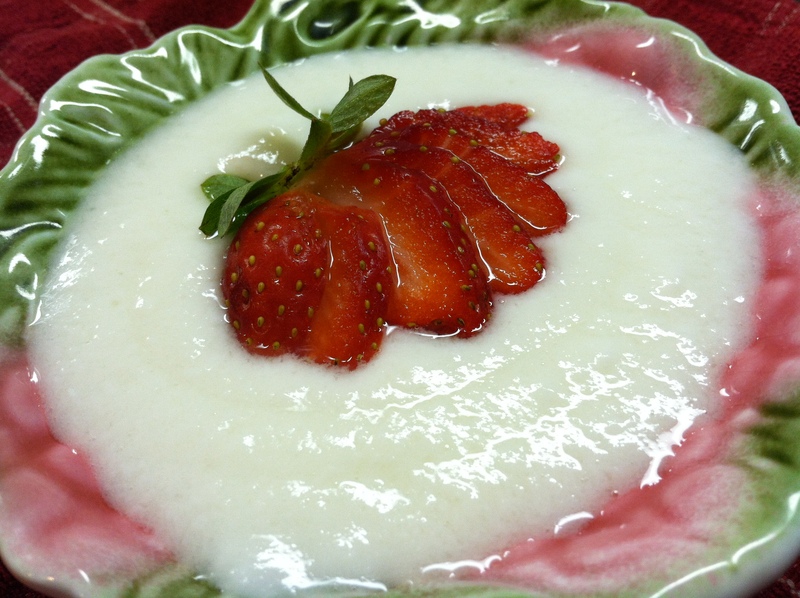 It’s best to use organic or yogurt you’ve previously cultured using yogurt starter. Some commercially prepared yogurts contain additives that may alter the finished product. Sterilize all of your utensils and equipment including the jars and lids you plan to store the yogurt in. You can heat a little water in the bottom of the slow cooker basin and let it steam with the lid on to do a pretty good job of killing any microbials on their surfaces. The other items you can place in boiling water for 30 seconds and dry on baking racks over a dish cloth. I even dip the racks in the water that I will be drying the equipment on. I always assume that if the yogurt cultures can multiply so quickly under those perfect conditions, so can any harmful microscopic organisms and the last thing I want to do is culture them! Of course, I’d like to think that the high numbers of probiotics in the yogurt would help to eliminate any bad critters that may be ingested at the same time. 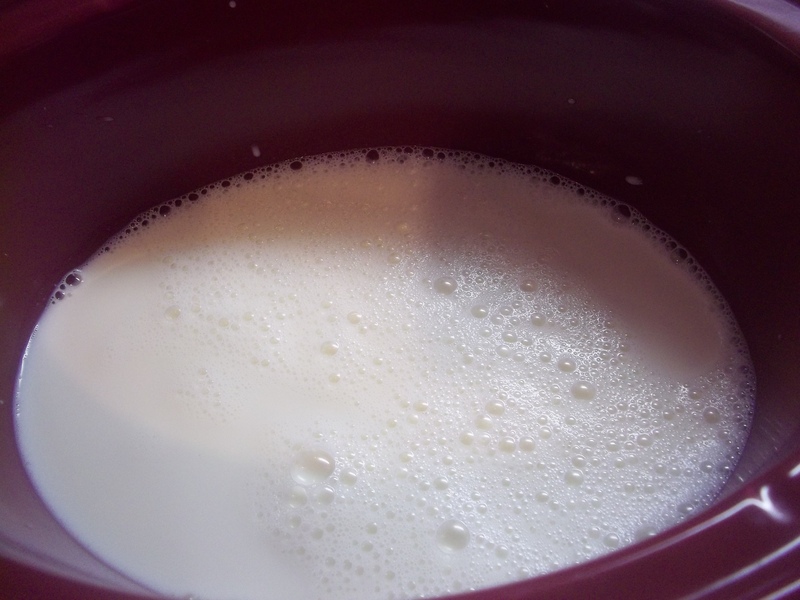 Turn the cooker to the warm setting a few minutes before your milk is ready to culture. 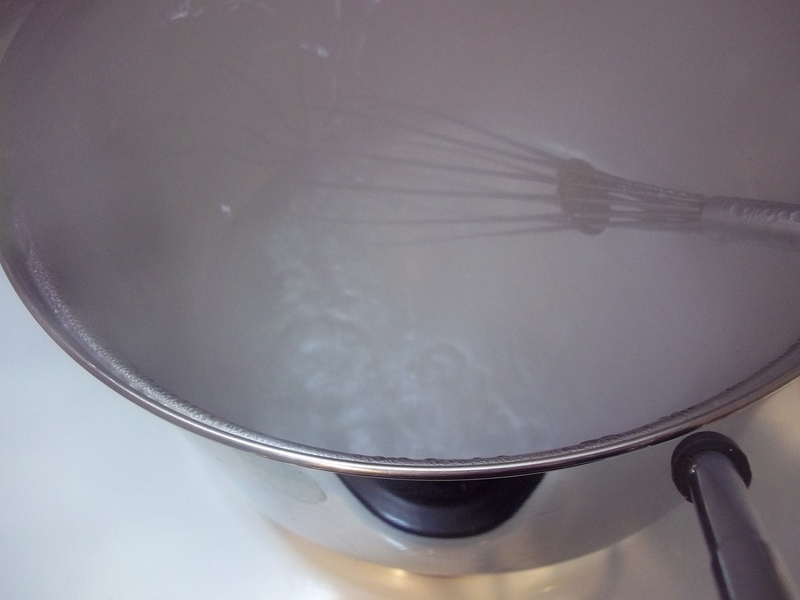 Heat the milk to 108 degrees in a stock pot on the stove. Add in the yogurt to use as a starter. Make sure it is combined well. Pour the liquid into the slow cooker. 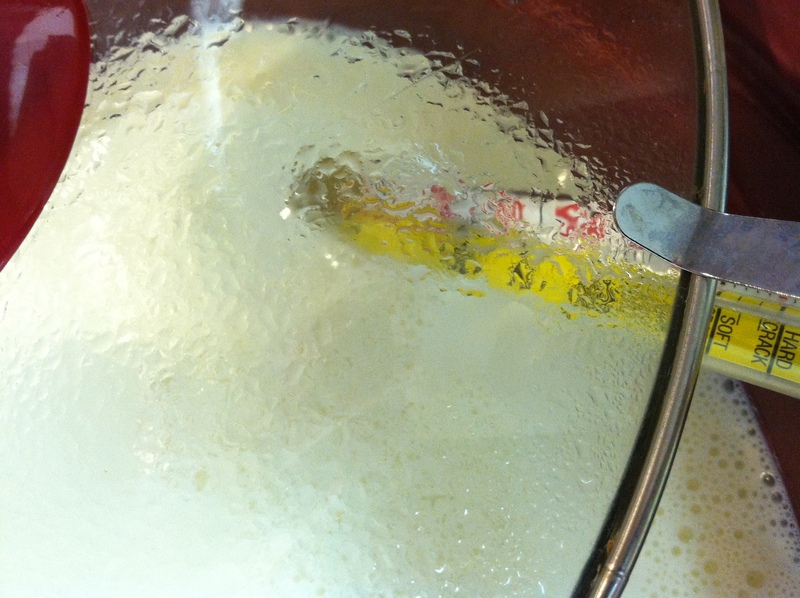 Place a candy thermometer in the liquid and prop it up on the side, using the lid to gently hold it in place. The glass lid of the slow cooker is conveniently transparent so it makes it easy to keep an eye on the temperature. I also have found that if the lid is askew my candy thermometer clips right to the edge of it and holds the tip in the yogurt as it cultures. It will take four hours for the milk to turn into yogurt. If it gets too cool, the process will stop. If it gets too hot, the cultures will be killed. Regulate the temperature between 108 and 113 by checking periodically. You can adjust the internal temperature by turning off the heat for a bit and removing the lid if need be. I set my oven timer for every 30 minutes and only had to adjust the temperature a few times during the 4 hour period. 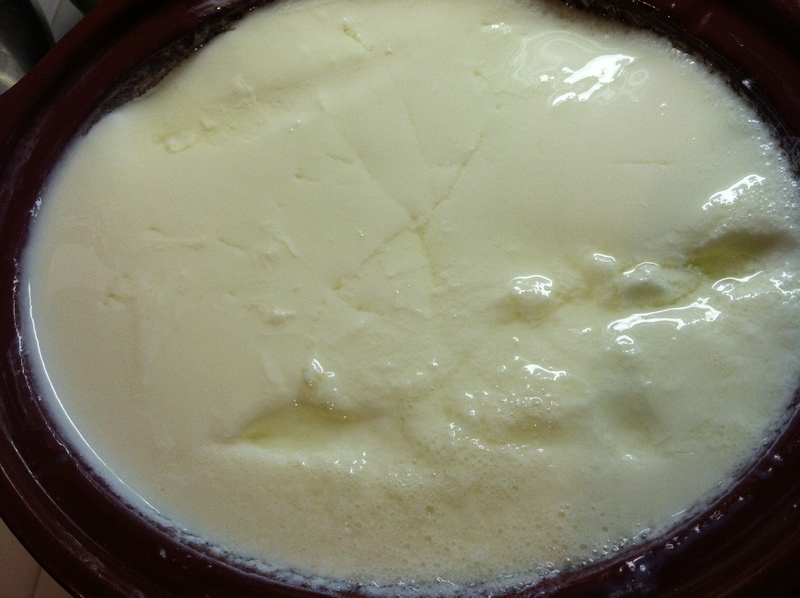 Chill the yogurt as soon as the time is up and it is thickened. Update: January 2012, I used a single serve carton of Yoplait Greek Style yogurt to make a full gallon of homemade and ended up with a much thicker finished product. I was concerned because the prepared yogurt I used as a starter contained gelatin, but it did not affect the outcome. 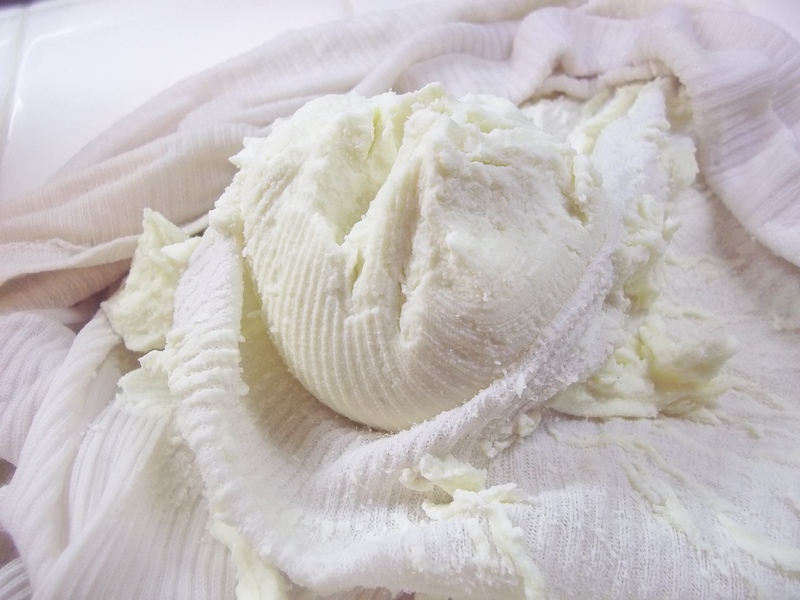 You can strain it in several layers of cloth to make a thicker yogurt or even overnight for a creamy spread. I have even pressed it after straining overnight to make a soft farmers cheese that almost has the texture of Feta. If you add salt before the pressing, it tastes very much like Feta. If your yogurt doesn’t thicken, there was probably a problem with the temperature, but don’t throw the finished product away. 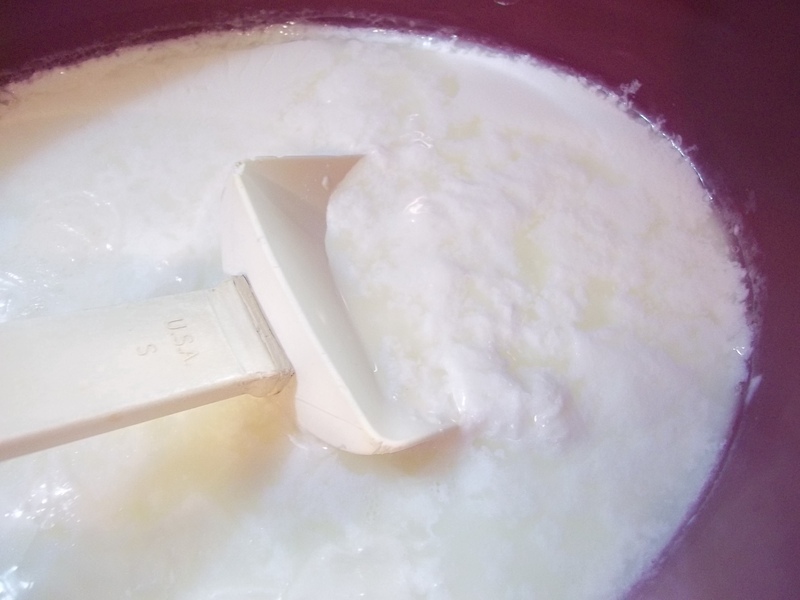 You can use it on cereal or other dishes the same way you would use milk or kefir. Update: April 27, 2012. I’ve just had a unique experience with my slow cooker yogurt making. My latest batch just finished in less than half the time it usually takes. The differences in the process this time were that A. I used non-homogenized, pasteurized whole milk from a local creamery that I skimmed myself, and B. I used about 1 1/2 c. of yogurt as a starter and only 3/4 gallon of milk. That is a greater starter to milk ratio but still, I assumed it would take the same amount of time. I will try to duplicate the process and report my findings here the next time I make a batch. Yogurt in half the time sounds great to me! OMG this recipe sounds like something I could tackle myself. All the other DIY Yoghurt recipes sound so complicated. Would you recommend using full cream or skim milk? Thank you. And thanks for following! I have used skim and full fat milk with this method. 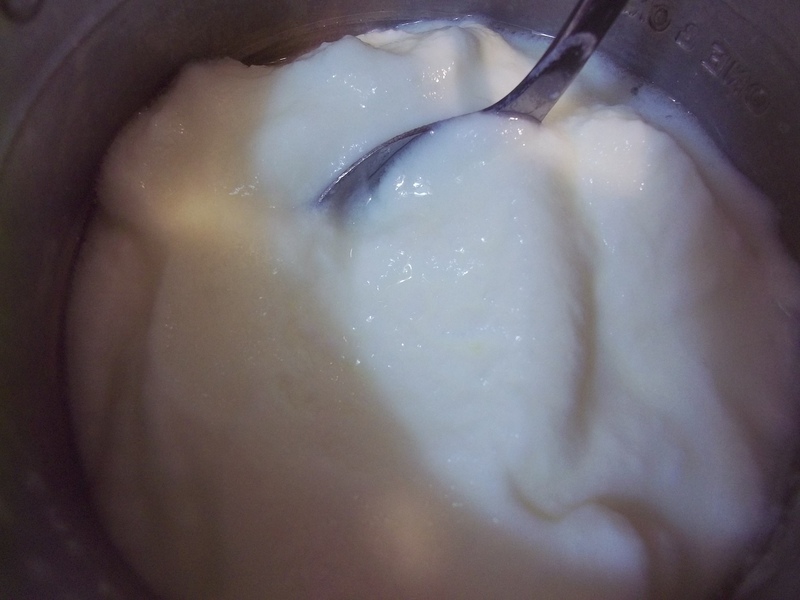 I have noticed that when I make yogurt from non-homogenized whole milk that I have skimmed myself, there are traces of fat on the surface of the cultured milk once it has chilled. I just scrape the globules off or mix them in. Homogenized whole milk doesn’t do this, just firms up smoothly. the benefits of non-homogenised milk are clear – much better for you! in the homogenising process it’s not just the fat molecules that are broken into smaller pieces but all the other components of milk such as the proteins including hormones etc. Your digestive system can ‘choose’ what to absorb from proper non-homogenised milk by it’s own enzymes breaking down what your body needs. Homogenisation causes all sorts of molecules to bypass the ‘selection process’ and your body gets the lot, growth hormones, antibiotics etc. Nature made milk as it is for a very good reason and our digestive systems are not designed for homogenised milk – ever expressed human milk?? it separates just like non-homogenised as nature intended! Instead of cows milk could this be made with almond milk or coconut milk or even canned coconut milk or goats milk? I’ve successfully used this method with goat’s milk. It was just another step from there to make goat cheese by straining it. Almond milk didn’t work. I want to try almond milk again since my family only drinks it now. If I ever get good results I’ll post them here. Thanks for commenting. We have The Hungry Games going on right now and you just earned an entry by commenting. The drawing is Monday, April 15th, and the prize for this month is The Silence of Bonaventure Arrow by Rita Leganski. Good luck!